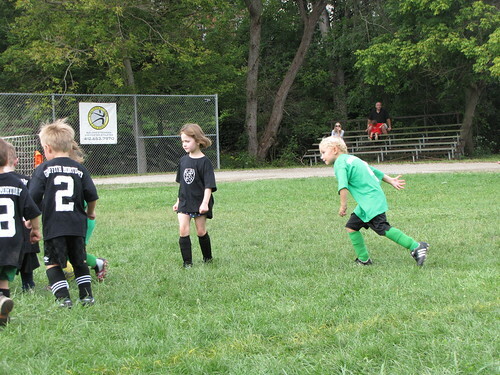 Yesterday Abby had her first soccer game. She was so excited before going that she could hardly contain herself. She was jumping all around and kept asking if it was time to get Zach up from his nap and go. In some ways I can’t wait until she can tell time so maybe she will stop asking if it is time yet. Anyways…Abby got into her soccer stuff (cleats and shin guards), we got her team shirt when we arrived at the game, and we were off. When we arrived a little signage or guidance would have been nice. We had no idea were to go as there were several ages and teams. We just looked for the smallest looking people figuring they would be the 5 year old kids and started asking people if they knew where to go. We found Abby’s team, which was the black team and got her shirt. The way they do it for her age is they have practice before the game and then play the game, instead of a separate night of practice during the week. The coach did several games with the kids to get them dribbling the ball and learning how to stop the ball with their feet instead of hands. Most of the kids looked confused and weren’t really sure what to do. The other team we were playing against were on the other half of the field and they looked as though they had practiced together before. Their coach had them going through drills of passing the ball and dribbling. They seemed to do quite well. We will see how it goes next week. The game started and at first Abby went in to play. They have 4 kids from each team play at a time until a goal is scored, though they don’t keep actual score. Depending on how fast that is done determines how long you are in the game. 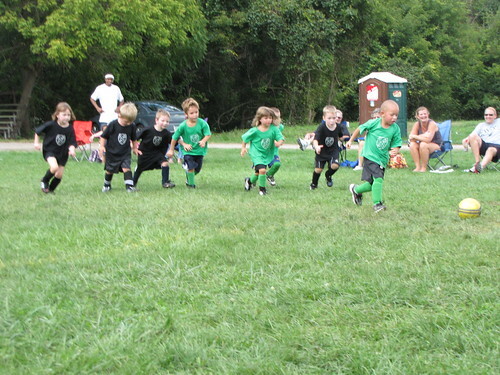 Several times there was a goal immediately upon restart, so kids weren’t always swapped out. 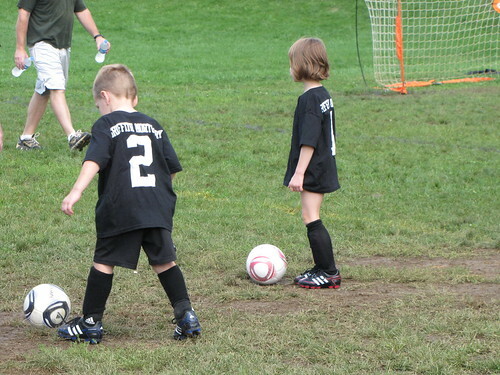 There is one particular boy on Abby’s team that is a natural born soccer player. You could tell he had an older sibling that played and possibly his parents. 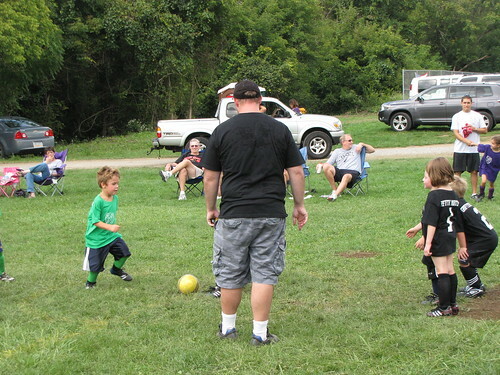 I think he scored the most out of the all the kids on Abby’s team. Abby on the other hand ran down to the far side of the field after the ball, stopped, and began to cry. She ran back over to me and said she didn’t want to play and that she just wanted to be with me. The coach kept trying, but Abby refused to play. During half time the kids get a snack. We were selected to bring fruit and water for the half time snack for the first game. We brought grapes and little water bottles. All the kids loved the grapes and some even asked for 2nds. After the half the game restarted. At first Abby didn’t want to go in again. We tried everything to get her to go in including bribes. I thought if she would just try it she would love it. Nothing worked. Then her coach came over again and said he would run with her. She took his hand and actually went in. 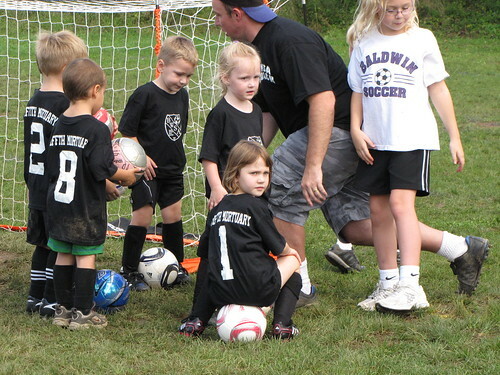 She played for the rest of the game since she didn’t play at all the first half. Played is a relative term. She barely touched the ball and spent most of the time just running back and forth waving to us or giving us the thumbs up. The only time she got the ball was when it came to her by chance. Hopefully next week it will be different and that by the end it will be something she wants to continue, but if not we can always try something else.